The 96th Tour de France is just a month away, starting from Saturday July 4th to Sunday July 26th 2009. It’s amazing how many people who do not cycle at all have become fans of this great and gruelling race, yours truly included. The tactical aspect of the race is very complex and interesting, the riders are so admiral for getting up every morning to face the next stage of this 21 stage race, and as a bonus to viewers it’s quite like watching a travel show as well. Many viewers who watch Le Tour de France have been to various parts of France on holidays and this great race brings back memories of those trips. 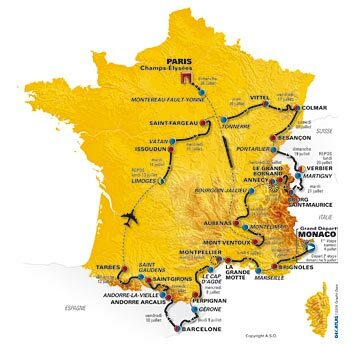 The Tour’s live television coverage is always fantastic as they give viewers a bird’s eye view of regions that the Tour de France route takes and the commentators are very knowledgeable and also provide tourist information about the various towns and regions. I don’t know about other countries, but Australians have an added bonus in that Gabriel Gaté does a cooking session each night, whipping up a dish or dessert from the region of the day, always making it look so easy. As usual, there will 21 stages covering a total distance of 3,500 kilometres. The selection of the towns which the Tour goes through is a rigorous process. The town must be able to ensure that the peloton’s arrival and departure is able to take place under optimum conditions in terms of sporting entertainment and rider and public safety. There are of course lots of other practical considerations as well. More on the destinations later ….